Tech Center: Samsung GALAXY Tab makes iPad look old technology? Samsung GALAXY Tab makes iPad look old technology? After the launch of the iPad tablet device from Apple earlier this year there has been a large number of tablet devices that have flooded the market in the past few months, you name it and its there. Tablets are easy to use portable and have a better battery life, have larger displays which make it suitable for watching movies/videos as an Ebook reader and a full web browsing device. On 2nd September Samsung Electronics Co. released its first ever tablet device called the Samsung GALAXY Tab (Model: GT-P1000). 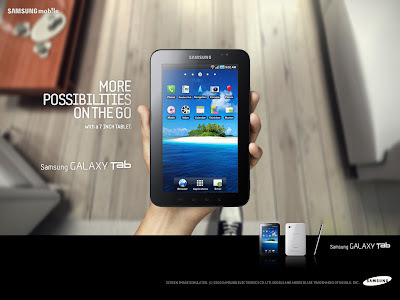 This is the beginning of the new generation of mobile tablet devices from Samsung. Moreover it is the industries first DivX certified tablet device and will fully support DivX HD video playback. The GALAXY Tab is one amazing device when it comes to specs, Its like the Samsung Galaxy S gone large. It runs on the Latest Android 2.2(Froyo) OS which gives you access to the big app library on the Android Market Place. It features the 1Ghz Cortex A8 processor which will handles all intrusive tasks with ease. It has a dimension of 190.09 x 120.45 x11.98 mm and just weighs at 380gms which makes it ultra portable. It features a bright and large 7-inch (1024x600) so you can enjoy high res HD movies. It even supports multi-touch zoom. It has 16/32GB of onboard storage plus you can add another 32GB via a MicroSD card. It also features 2 Cameras a 3MP With Auto focus and flash in the back and 1.3MP in the front. So you can have video calling and video conferencing. There's a 30-pin dock connector on the bottom that allows for HDMI, USB, and docking accessories. Moreover Samsung also has The ‘Readers Hub,’ Samsung’s unique e-reading application, provides easy access to a vast digital library from classical literature to the latest bestsellers and reference materials. At the same time, Samsung unveils ‘Media Hub,’ a gateway to a world of films and videos, and ‘Music Hub,’ an application giving access to a wide range of music tunes. Which adds more to the already beefy hardware it offers. As far as pricing and availabity is concerned things are not clear it will be first available in Europe. The pricing is a big question to be answered too. Its just an ultimate portable device, frankly the iPad is no competition for such a device when it comes to specifications. Now we will probably find more mobile manufactures coming up with tablet devices which will give consumers a wide choice, competition is always a win win for consumers.